Transform ordinary chicken nuggets into tasty, time-saving dinners. Crumb-coated pieces of tender chicken cooked to a crispy golden-brown count as comfort food to many who fell in love with the savory nuggets during childhood. The tempting morsels have grown-up appeal when they show up on the dinner table in tasty entrees and side dishes. Celebrate nostalgia or create new family traditions with ready-to-cook nuggets from the grocery store's freezer or made from scratch. 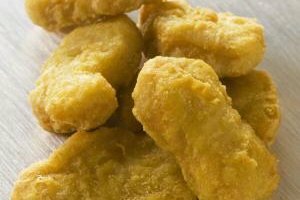 Culinary masterpiece preparation may not fit into your busy schedule, but with chicken nuggets you can put hearty, flavorful meals on the dinner table without a lot of fuss. Breaded chicken pieces topped with tomato sauce, Italian herb mix and cheese is a speedy, baked variation on classic chicken Parmesan. A platter of steaming hot rice with a mixture of baked chicken nuggets, stir-fried vegetables and teriyaki sauce serves as an Asian-style one-dish meal. Ordinary mac and cheese or your favorite shaped pasta with sauce can be jazzed up by stirring in cooked chicken nuggets, broccoli florets or peas. Bake and serve with a fluffy green salad for a fast, satisfying dinner. Main dish salads, like the ones you find on restaurant menus, can be replicated with ease when you opt for chicken nuggets baked to a light, golden crunch. Caesar salad dressing drizzled over nuggets nesting on romaine lettuce and grated Parmesan cheese pairs well with a dinner roll and glass of wine. Try a new spin on taco salad when you mound nuggets, lettuce, cheese, beans and salsa in a crispy, taco shell bowl. For an exotic twist, serve hot chicken nuggets on a bed of shredded Napa cabbage with tangerine segments, roasted cashews and a ginger-honey dressing. A pretty presentation of chicken, fresh vegetables and fruit is perfectly suited for those who prefer lighter fare at the end of the day. Create kebabs by threading cooked chicken nuggets onto skewers with cherry tomatoes, cubed zucchini, pineapple chunks, button mushrooms and table grapes. Serve the colorful kebabs with creamy sauces for dipping. Round out this finger-food meal with toasted garlic bread, multigrain blueberry muffins or flaky croissants with butter. Add flair to a soup and sandwich supper by loading a crusty roll with chicken nuggets, cheese, sliced tomato and lettuce. The sandwiches can be customized for each diner's taste by adding relish, herbed mayonnaise, thin-sliced red onion, Dijon mustard or spicy ketchup. As an alternative to bread or rolls, serve the crispy pieces of chicken and filling wrapped in flour tortillas. Give this type of dinner a personal touch with homemade nuggets that have a crunchy coating of seasoned, crushed cornflakes or panko breadcrumbs.